The Manitoba Government has announced modifications to its Provincial Nominee Program. A few of them will be implemented with immediate effect from November 15th, and others will come into effect in 2018. 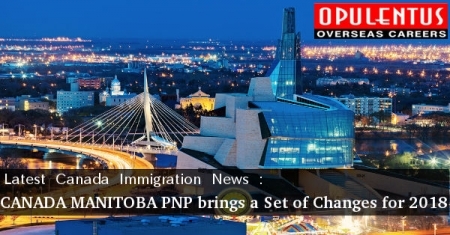 The Manitoba Provincial Nominee Program aims at the immigration and allows Manitoba to welcome new immigrants. These immigrants are capable to establish themselves (and their families) in Manitoba, after meeting the eligibility criteria laid down by the province. The changes coming into effect from November 15th, are the introducing a fresh list of in-demand occupations, allowing the MPNP, to provide a view of the priorities of the business investment and current labor market of the province to potential applicants. They are required to submit Expression of Interest, to apply to the program. The present MPNP-B has a new name called the Business Investor Stream. It will feature two pathways, the first being the Entrepreneur Pathway followed by the Farm Investor Pathway. The new Manitoba Express Entry Pathway will be introduced in January 2018, and it has been aligned with the Express Entry. It will prioritize candidates who possess high human capital and have skills, expertise, experience, and training, in an occupation which figures in the list of in-demand occupations of the province. New criteria of Business Investor Stream are scheduled to be implemented during the first quarter of 2018. Moreover, there will be an International Education Stream, aimed at international graduates hailing from the spheres of Science, Engineering, Technology and Mathematics programs in the post-secondary institutions of the province.